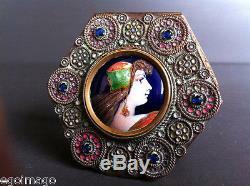 Sublime former revival-style powder compact with enamelled miniature and semi-precious blue stones. Diameter 6 cm x thickness 1 cm. Inscription on the back: made in France. For any further information please contact us. 06 62 83 27 42. Please read the terms of sale before any purchase. The item "sublime former powder compact Renaissance enamelled miniature made in fr" is on sale since Wednesday, December 3, 2014. It is in the category "art, antiques \ objects of the nineteenth and before". The seller is "egoimago" and is located in / in paris.